Are you looking for quality classic cars to hire for that special occasion such as a significant birthday, anniversary, short break or holiday? Are you thinking of buying a classic car but would like to try before you buy? 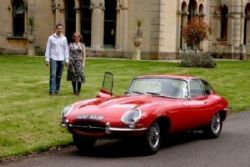 Do you want the wow factor at your wedding with the groom spiriting his bride to the reception in a fantastic classic car or a sophisticated and stylish honeymoon grand touring car in which the happy couple can depart? What ever the occasion the Historic & Classic-car Hirers Guild (HCHG) provides access to a National Network of the leading classic car hire operating companies, who maintain the highest standards of quality and service within the UK classic car hire industry and who offer the largest collection of self drive classic cars in the UK for rental by the day, week or even longer. Undecided where in the UK you would like to drive your classic car? Visit our map which indicates the locality of member companies and choose where to take your next short break or holiday. Companies are assessed on quality of service and the quality of their fleet of classic cars before being allowed to become Members of the HCHG. This site contains details of the HCHG, a map showing where our Members are located, together with a page for each member, detailing the classic cars they offer for hire and the other classic car hire related services they provide. Should you be looking for a particular classic car hire, then the quickest route is to look at the our database - Classic Cars for Hire. By clicking any of the column headers the database of cars can be sorted by year, make, model etc. When you have found the classic car hire of your choice, click on the details of the Member providing the relevant classic hire-car and then contact the Member direct. If you wish to find out more about the HCHG, the UK Classic Car Hire industry (or contact the HCHG itself rather than one of our members) please see our classic car hire contact page.